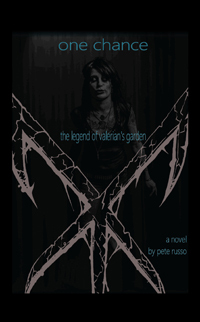 A year ago, industrial-goth band Valerian’s Garden exploded into the mainstream, seemingly out of nowhere. Their nonstop touring, incendiary live performances, and down – to – earth personalities have turned them into the darlings of the music world; their lead singer, Angel, in particular. For the first time ever, their reclusive, introverted front woman tells the complete story of how the five musicians found each other and set out on their journey. She’ll talk about the friends they’ve made and those they’ve left behind – and will explore, in depth, what the journey has cost. For more than two decades, author Pete Russo has been writing short stories, long stories, collaborative stories, and everything in between. He lives in Savannah, GA with his wife Amanda and their menagerie of animals. ‘One Chance’ is his first published work.